When a person does not have teeth in the jaw but have sufficient bones which can support implants, the dentist uses implant supported dentures. These are a type of overdentures that are attached to the implants. The regular dentures will always rest on the gums whereas the supported dentures stick on the implants. These are specially made for lower jaw because regular dentures are less stable there. Why Should You Consider Implant Supported Dentures? These dentures improve the smile and maintain the harmony of the face. There is a minimal risk of implant rejection by the body. This is a reliable, permanent and long-term solution for the replacement of the teeth. These dentures do not create a hindrance in the speech or alter the taste of food. These are stable and do not get affected by tooth decay. you can take your regular diet after the implant supported dentures. These dentures will prevent jaw bone loss and deterioration by stimulating the bone. The dentist will take an impression of your teeth. Before implanting the final draft in the mouth, a wax model is crafted to check the fit and the appearance. Once you are satisfied with this wax model, the dentist will make the final dentures using durable and natural looking dental materials. Once these dentures are created, these will be fitted into your mouth, and further adjustments will be made. What are the Possible Complications with the Procedure? Sometimes implants do not fit well, which may cause infection. 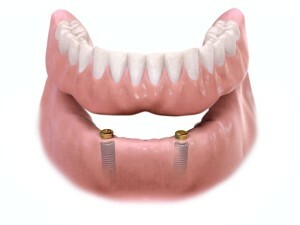 There are cases in which less space is available for the dentures framework to fit in. The teeth may lose their natural grip. If you grind or clench your teeth, the dentures might break. You should take adequate care of your gums and teeth after the implants. Brush twice a day and use floss once a day to remove debris between the teeth. You should visit your dentist every six months to secure the implants and to keep a check on the signs of dental problems. If there is any signs of gum disease or bad breath are observed, contact your dentist immediately.